The students of Mount St. Ursula should be proud of themselves. In a mission that started as a student fundraiser, each class was challenged to fill up a water jug with pennies, nickels, dimes and quarters to raise money for the school. Competing amongst themselves, the winners would get two class dress-down days (and some good, old-fashioned bragging rights). During the course of collection, the tragedy in Haiti struck. 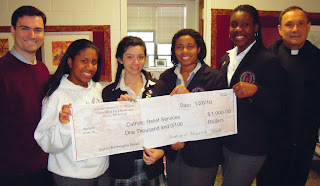 Everyone at the school was in agreement: all the funds collected would be sent straight to Haiti. MSU would utilize Catholic Relief Services, known for being one of the most efficient charity organizations in the world, ensuring that 94% of donations would go straight to the recipients. Mount St. Ursula's Office of Development/Alumnae Relations and its Student Council continued the effort, and on January 20th, it was announced that $1,350.32 had been raised, $1,000 of which went to Catholic Relief Services. It was, after all, still a competition... and victory went to the sophomore class. Mrs. Anna Ramos, Director of Development, announced, “I am so proud of our students who so generously contributed to the fundraising event. Their energy, positive spirit and willingness to help the victims of the earthquake in Haiti, are just reminders of how our students are empowered to serve others in the community and the global society.” Students of MSU are currently making plans for more fundraising efforts to support the people of Haiti. Photo Above: (left to right) Moderator, Mr. Glenn Stordeur, alongside the Student Council Advisory Board – Kailani Capote ’10, Kiara Vega ’10, Crystal McMillian ’10, Adeola Okoduwa ’10 and President, Fr. John Vigilanti.